The University of Queensland will establish a world-class Sustainable Futures Building, which will house the University’s Faculty of Engineering, Architecture and Information Technology as well as the School of Chemical Engineering. UQ alumnus and Chairman and CEO of American Dow Chemical Company Andrew N. Liveris has donated $13.5 million to help establish the Liveris Academy as well as an additional $26.5 million for UQ’s Not if, When philanthropic campaign. The proposed Sustainable Futures Building is an 11 storey building housing approximately 22,160 sqm of gross floor area. Heavy Equipment Laboratories (HELS) and multi-storey Pilot Hall occupy Level 1 with high student load learning and research spaces concentrated in Levels 2 to 5. Levels 6 to 11 house a combination of research laboratories and staff and student supporting office spaces. The initial/indicative construction budget for the new facility is reportedly worth approximately $100m+. UQ Vice-Chancellor Professor Peter Høj said the naming the building after Mr Liveris is a fitting acknowledgement of one of UQ’s most successful alumni, honouring his exceptional career and his role as a consistent, visible and enthusiastic advocate for UQ. “The Liveris Academy will teach and develop future generations of leaders, equipping them to discover and implement technology driven innovations that address grand challenges related to sustainability in a time of dramatic social, technological, economic and environmental change,” Professor Peter Høj said. Mr Liveris said he was delighted that the Liveris building would provide a new home for chemical engineering and related disciplines at UQ. “Paula and I hope the Liveris Academy will attract, support and develop many of the planet’s smartest young people and finest minds in engineering and science, enabling them to reach their full potential while addressing major challenges facing society today,” he said. 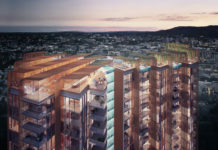 Lyons + m3architecture have designed a building which will have very high energy and water sustainability initiatives. According to M3architecture, its distinctive glass skin provides a highly energy-efficient facade, while energy-intensive research areas are offset by expanded renewable energy photovoltaics on the roof. “The project allows the School to continue to evolve, while opening up opportunities to discover its future direction. 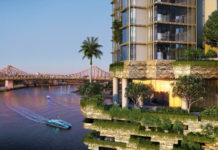 It will amplify the School’s profile as a hub of chemical engineering leadership in the Asia Pacific region, within the city of Brisbane, and advance its connectedness and profile on the global stage.” – M3 Architecture. Professor Høj said the initiative bolstered UQ’s efforts to empower student success, transform teaching and learning and drive discovery and impact through the Not If, When campaign, and was the largest contribution to the campaign to date. “This gift will create leadership and change-making opportunities for students who might otherwise have had limited access to higher education,” he said. A rigorous selection process for the Liveris Academy will identify promising students with leadership potential and a passion to address sustainability issues involving clean water, safe food and modern energy services. Mr Liveris said he hoped the donation, initiative and the building, housing cross-disciplinary activity, would allow students to garner a real-life understanding that many global challenges required large-scale innovation and leadership to create positive change for society. 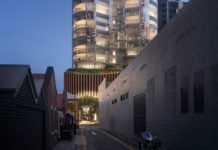 News by UQ, Lyons and m3architecture.